Through the Grace of the ever-living Divine Presence within you, a portal opens on December 12 offering a new initiation into Light. As the vibrational frequency of the 12:12 resonates, your Merkabic field is activated. The MerKaBa is a vehicle for your ascension as a Light Being in human form. The magnificent sacred geometry of the Star Tetrahedron will be activated around you by the codes at the 12:12 portal. This Star Tetrahedron will create a powerfully-shining starry shield of Light that holds the resonance of your Soul’s Divine Blueprint. The building of your MerKaBa will be completed on the Solstice, December 21, 2013. Throughout those 9 magical days, an increasing resonant frequency will be present in your energy systems. You will feel moments of Brightness and Clarity, as if your very cells are radiating Light, and this indeed will be the Truth. Your MerKaBa (Mer – Light, Ka – Spirit, Ba – Body) contains the new structure for your awakened consciousness. It allows your light body to empower your physical life so you can thrive as a fully blended Divine Human during this New World Awakening. Your Merkabic field holds the Divine Blueprint for your Soul’s Highest Destiny. As you create this new structure within the matrix of your being, you are opening new pathways for fulfillment of this destiny. Throughout the recent years, the 12:12 activations have anchored new structures into your energy systems. The initiation that took place on 12/12/2011 brought the deep connection to Unity Consciousness through Christed Light. The 12/12/12 activation created the new 12-strands of DNA within your cells and opened the way for the 12-Chakra system. This year the 12:12 activation builds on those powerful connections and brings forth a new level of empowerment for all those who are awakening in this expansive time. The potential of this new initiation into your Light Body vehicle allows you to align with the most authentic, eternal Divine Self within your physical being, so becoming the HomoLuminus – a Divine being of Light in human form. There are many who have spoken of this MerKaBa over the years and it would be good to educate yourself. Essentially, this is an empowered structure of interlocking tetrahedrons that anchors perfect balance as they meet at the Still-point between your solar plexus and heart. The Star Tetrahedron connects all aspects of your being in perfect Divine Union. In the moment of time demonstrated by the clock at 12:12 all over the planet, alignment begins within the human heart connecting to the Unity Consciousness as a state of being. If you could only see from the Angelic viewpoint, it would appear that humans are acting as lightening rods when they receive this immense download of golden Christed Light and ground it into the Earth. When there is no resistance, you open to this Grace-filled presence and spark the Divinity in every cell of your being. You are encouraged to take 12 minutes at the 12:12 hour on the day of December 12 to bring conscious awareness to that powerful activity of Divine Light and allow it to work within you in a state of Oneness with All That Is. Visualizations are often helpful. The impulse of the Christ Light is like a brilliant Golden River that flows from Source energy above your head into the Earth, creating a bridge of Light from Heaven to Earth, connecting you to All That Is. Ask that this Golden Light permeate your heart with Wholeness and bring Divine Love into every organ and cell of your being. Allow it to expand outward into your energy fields, and see yourself as the Angels see you – a radiant Light expressing in the world as Divinity. 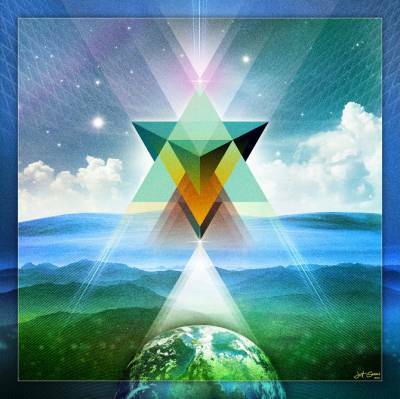 The Star Tetrahedron is an image that your Soul will resonate with. Hold the vision of your new MerKaBa in full activation of Light surrounding your physical as well as your blended mental/emotional fields. As you create an empowered vision of the Star Tetrahedron, the energy frequencies within the new light structures of the 12:12 codes will activate your energy centers in a new way. When you ground this energy you create a deep vital connection to an Earth awaiting this time of honoring. You have unseen partners whose work includes your evolution, to assist in the creation of a fully-functioning world that operates on a higher frequency of Light and Divine Love. Breathe in this empowerment to the core of your being and allow it to anchor there. Have a sense of the powerful new place of Balance within you that is above your solar plexus and beneath your heart. Here is where your inner gyroscope will serve to keep you in a place of neutrality and equanimity so you can thrive in multidimensionality. Know how important you are as a link in the conscious evolution of a new world, where Peace and Harmony can live in the human heart. As the Earth becomes sanctified, Balance, Vitality and Love will thrive once more within the planet and all beings that live here. Through the 12:12 portal, there will be a sense of being reborn into unity with all aspects of you. Greet yourself with a new level of respect and honor your commitment to this life. Your willingness to continue on the Path of Light throughout time has brought you to a completion of one aspect of your soul’s journey. Your new MerKaBa will now empower the next phase of your evolution. Light alone cannot create the connection, even though the Divine Intelligence is there within the Light Force. Divine Love is required to awaken the coding of your Soul’s union with the completion inherent in the Twelve. Connecting to the golden light of Christed energy will awaken Divine Love within you. Allow the Christ Light to permeate every cell and create a new healing force that will pervade your consciousness. When you integrate this alignment within you, the Divine Love in your energy fields will activate the magnetic fields around your DNA and become so pervasive that your world will literally begin to change around you. This connection to Christ Consciousness was coded at 12/12/2011 and is now available whenever you see 12:12 on the digital display. Further evolution on planetary levels creates new openings for souls to step into. Those whose light-encoded DNA has allowed their energy frequencies to shift, now work in a multidimensional earth simultaneously magnetizing other souls. An entrainment of energy frequencies ensues as your own inner coding, firing in resonance, attracts more who are ready for the awakening. You were born for this. Now is your time. Join with others in the 12:12 timings to assist the firing of new matrix energy codes. Hold and empower the image of your beautiful MerKaBa, a Star Tetrahedron radiant with the Golden Light of Oneness – true Unity Consciousness. This will be the structure that helps you thrive as you create a new Earth that is evolving – one where the spirit within all things in honored, and beauty and harmony are sanctified. The use of your breath and prayer work are the most expedient ways to lift your energy frequencies. Here is a suggestion to empower your intentions. The Sacred Breath works best when repeated 3 times on each chakra. During this 12:12 Activation, I invite the Divine Love and Golden Light active in the Christ Consciousness to flow gracefully through me and anchor upon the Earth. I now ask for an experience of the connection within my DNA to Divine Love, Compassion and Light from the Highest Source that I can receive. I invite an alignment with my Soul’s Highest Destiny for the good of my evolution and the evolution of the Earth at this time. I invite the assistance of the Angels, Archangels, Masters and all the beings of Light who work for my awakening to be with me in this process. I ask for a connection with my Highest Self so that I create more conscious awareness around my evolutionary process. Within the power of this alignment, I now create a perfect MerKaBa field around me that most supports my evolution of consciousness and the fulfillment of my Soul’s Destiny on Earth this lifetime. I know that this beautiful golden Star Tetrahedron is being empowered by my Oneness with All That Is. May all beings awaken to their Divine Potential and bring the presence of Divine Love into their hearts. May ever more Grace flow through us all to bless the Earth and honor her in a new way so all may thrive. May every heart feel the gifts of this loving Presence within them so Divine Love may prevail on Earth. Thank you God. And so it is. This message may be shared in its entirety as long as credit is given to the author(s). Shanta Gabriel led an inspired 12:12 Portal Teleconference on December 12. A recording of this powerful gathering to activate our Merkaba is available here. These powerful activations began the portal journey that will continue into full anchoring of the Merkabic Light fields on Solstice, December 21, 2013. This meditation is deeply peaceful and reassuring. With Shanta Gabriel’s gentle voice, you are guided into a place of Balance so that Nature can nourish you and you can allow the new high-frequency Light energies to work with you and empower your life. As you create a Sacred Matrix in the form of an octahedron within and around your body, it allows you to have appropriate boundaries to live your life in more effective ways. With the addition of Infinite Love in that space, you can trust that you are being cared for in very supportive ways and Creative Solutions abound at all times. The meditation is available to purchase here. It seems like we need to give ourselves credit just for the ability to continue walking around during this Tsunami of Change we are experiencing. We are in the midst of energy waves caused by an 11-year shift in the polarities of the Sun. Adding to that, there are solar flares and four comets (oh my). We also have Pluto stirring up our deep and dark inner resources. “Mining for buried treasure” is the way my astrologer friend, Kelly Beard (KarmicTools.com), describes this event. Kelly reminded me that the way diamonds are mined is by exploding the earth around them. I admit that at times it has felt as though I am being blown up from within my solar plexus. At a very archetypal level, Pluto causes us to examine the underworld within our psyche to find the jewels that we can carry into the next phase of our lives. When I realized that we still have 2 months of this deep personal examination left to go through, I knew that even I could not keep up the critical judgment of my personal process for that long. It is really important to not take all this upheaval personally but to apply as much neutrality as possible to the energy we are all experiencing. During this Year of the Snake of Chinese Astrology, we are shedding the skin that no longer fits our sense of self so that in February we can move into the empowerment of the Horse. The Universe is delightfully orchestrating all this so we can find the most true and valued essence of Self in order to fulfill our Soul’s Destiny in this lifetime. Add in a Venus effect that is giving us similar experiences to those that affected us back in 1997. Most everyone I know talks about that time as heavy and dark where basic structures were blown apart. For me personally, 1997 was when my business started to collapse, which led to losing my home, marriage, appendix and deepest sense of self in one year. In this momentous time, we are all moving up to a new level of Soul’s expression. Some of us have been given glimpses of our most exalted and treasured future self, making it all the more uncomfortable when we find our selves back in what feels like the “hell realms.” The fact is that we are in a cook pot for the next two months and our primal stew is not yet ready to eat. In this raw and uncooked state, it requires monumental intentionality for us to stay focused on the most beneficial and delicious outcome for our soup. For me, I have been looking to stay in the place of inner balance, where neutrality is the best I can achieve in the moment. When faced with this deep level of upheaval, the most resourceful place I can go is back to my basics — the values instilled by 40 years of spiritual practice. The year 1997 was also when my first book, Angel Messages, was published along with a set of inspirational cards. The messages that I received at that time were all addressing the very same dynamics I am experiencing right now. I decided to go to the revised version of this book, The Gabriel Messages. There, I found that the insights still reflect the practical and compassionate wisdom that I most need. It seemed like a fitting place to begin my new offering — Inspiration for the Week. On December 1, the Inspiration for the Day morphs into the Inspiration for the Week. If you are already signed up for the daily emails, you will now receive the new, more detailed level of wisdom and practical guidance from Archangel Gabriel and me. My intention is to provide a platform of inspiration that we can hold together for the entire week and create a network of love that will bless the world through our shared focus. I am also opening an invitation for you to support me to defray the time and cost of providing this offering. To prepare the inaugural issue, the card I received is number #51 — a stunning reminder for my perfection-oriented ego self. Your Soul Wants to Soar! Empower your Soul's Highest Reality with Transmissions from the Archangels! Available now at ShantaGabriel.com. Sign up here to receive our newsletter and Inspiration for the Week. "Wow...this comes as the answer to a question I've been struggling to resolve. Thank you!" "I just wanted to take the time to tell you how much I appreciate your words of encouragement, wisdom and openness. Thank you for all the wonderful work you continue to do on the planet and for the planet." "Thank you Shanta for all your powerful words of wisdom and knowledge. I so enjoy and look forward to your messages." "I would like to say how grateful I am to read your weekly inspiration pieces every week and how they inspire and uplift at the changing times!" "I just wanted to take this opportunity to express my gratitude to you for the channelled messages you make available to all of us on your website. They always touch and inspire me and I am sure they have helped greatly to raise my consciousness." "Great inspiration, starting with a great title. You are a very good writer; your inspired words have a natural flow and very clean energy. I feel so good deep inside when I read and listen to you." "Thank you Shanta for this gift from the angelic realms. Your generous heart and soul is experienced in each of your writings!" "Your weekly inspirations are treasured." "Wow, I loved this description of letting go of fear. It really resonated with me especially because this is one of my intentions for 2014. I did the practice on top of Mt Shasta and saw myself flying around the mountain on the wings of angels. I feel very free to know I will always be held up." "Thank you for the wonderful weekly inspirations you're sending out!! So nourishing and supportive." © Shanta Gabriel. All rights reserved.